Anonymous sale, Semenzato, Venice, 8 June 2002, lot 200. Acquired by the previous owner in 2002 and thence by descent to the present owner. This work is sold with a photo-certificate from the Fondazione Giorgio e Isa de Chirico, dated 'Roma, 9 luglio 2001'. 'Mr de Chirico has just recently acquired a glove of pink rubber, one of the more extraordinary objects that one can find. It is destined, once copied by the artist, to render his future works even more striking and disconcerting than his past ones. If one asks him as to the terror that this glove is capable of exciting, he will speak to you immediately of the still more terrifying toothbrushes just invented by the dental art, the most recent and perhaps the most useful of all arts' (Guillaume Apollinaire, 'Le gant rose', Paris Journal, 4 July, 1914). Le chant d'amour (The Song of Love) is one of de Chirico's most famous images. A bizarre collation of a plaster head of Apollo, a ball and a rubber glove, it is an image that announces the poetic and metaphysical potential of ordinary objects to conjure a sense of mystery and of the artifice of appearance. 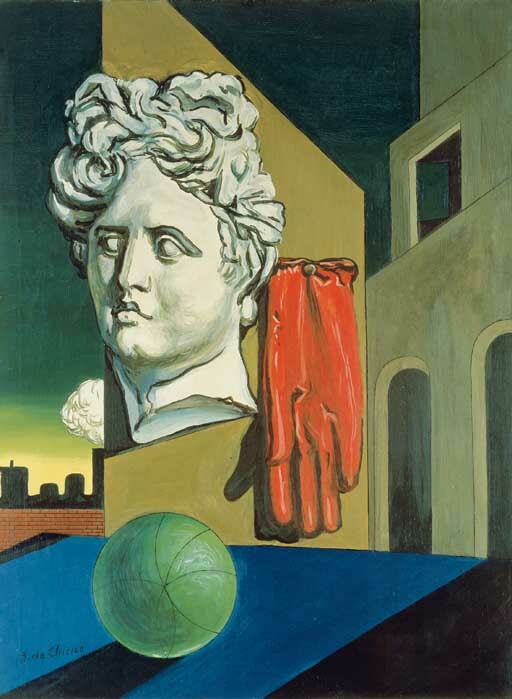 It was originally intended by de Chirico to be an exploration of his childhood memories - the ball, the train, the wall and even the rubber glove (a common tool of the midwife) symbolising birth. But, in the process of being made, the painting transformed itself into this enduring enigma - one that inspired a thousand Surrealist paintings. The equally enigmatic but strangely appropriate title of the work was bestowed upon it by Guillaume Apollinaire and the original work of 1914 is now housed in the Museum of Modern Art New York. The present work, executed in 1960, is a variant of the original. It belongs to what has been described as his 'New Metaphysical' period, in which the artist revisited many of his earlier paintings and reinvested them with a brighter and more reassuring sense of optimism. In contrast to the oppressive sense of melancholy and the dark atmosphere of mystery and menace in the original, this 1960 reworking of his famous painting depicts the light of dawn rising behind the permanently passing steam train. As simple an alteration as this to the original image has a surprisingly powerful effect and bestows on this work with a completely different atmosphere.